Today is officially the Second Sunday of Easter. Since “geniti” translates as “newborn” and the translation of “infantes” seems self-evident, the “quasi modo” in question roughly translates, “As if in the manner” (of newborn babes)… And incidentally, that character in The Hunchback of Notre-Dame was named after the opening words of First Peter 2:2. (See The Bible – Lectionary Musings and Color Commentary, and also First musings – The readings for “Doubting Thomas” Sunday, both from April 24, 2014). On the other hand, the Peter Restored post addressed the question: If you doubt and question your faith – like Thomas did – will that faith actually grow stronger? In other words, how do we as Christians deal with our doubts? Re: “Low Sunday.” See Why Attendance Will Be Low This Sunday, and also Low Sunday | Article about Low Sunday by The Free Dictionary. Re: “Both from April 24, 2014.” I apparently published two separate posts on the same topic. 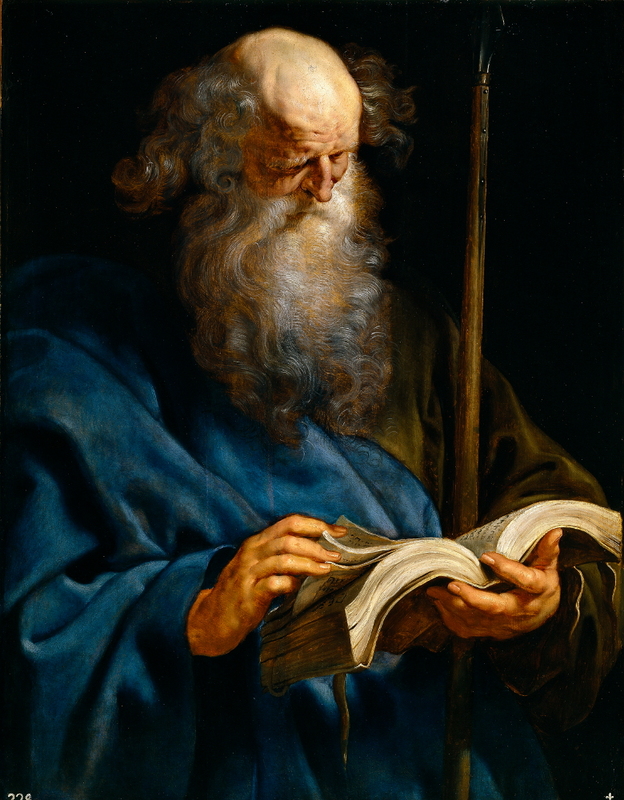 The lower image is courtesy of Peter Paul Rubens: St Thomas – Art and the Bible. This entry was posted in Feast Days, Sunday Bible readings on April 24, 2017 by dorscribe@aol.com. … festival and holiday celebrating the resurrection of Jesus from the dead, described in the New Testament as having occurred on the third day of his burial after his crucifixion by the Romans at Calvary [circa] 30 AD. It is the culmination of the Passion of Jesus, preceded by Lent (or Great Lent), a forty-day period of fasting, prayer, and penance. Which pretty much sums up the Lesson of Easter. But what’s this about the Easter Bunny? In legend, the creature carries colored eggs in his basket, candy, and sometimes also toys to the homes of children, and as such shows similarities to Santa Claus or the Christkind, as they both bring gifts to children on the night before their respective holidays. 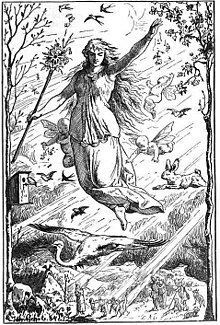 Ēostre is attested solely by Bede in his 8th-century work The Reckoning of Time, where Bede states that during Ēosturmōnaþ [“Easter-month,” in general, the month of April], pagan Anglo-Saxons had held feasts in Ēostre’s honor, but that this tradition [was] replaced by the Christian Paschal month, a celebration of the resurrection of Jesus. 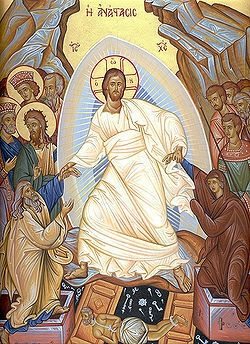 The upper image is courtesy of Easter – Wikipedia, the free encyclopedia. 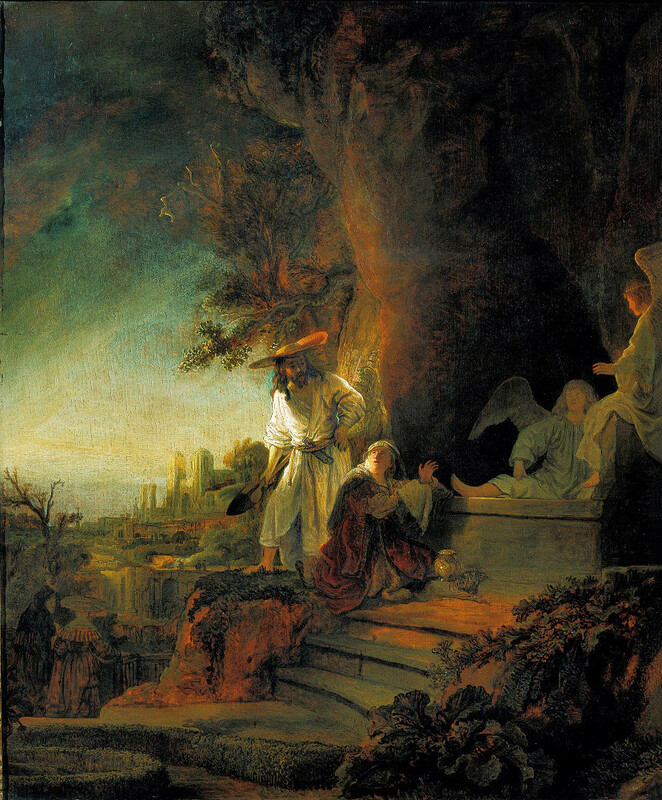 The lower image is courtesy of “The Risen Christ Appearing to Mary Magdalen” – Art and the Bible. See also Rembrandt – Wikipedia, and/or Rembrandt van Rijn: Life and Work. This entry was posted in Feast Days on April 16, 2017 by dorscribe@aol.com. Which is pretty much what they did to Jesus at the Crucifixion. So, in order, Matthew 27 tells first of Judas Iscariot hanging himself for betraying Jesus. Then comes “Jesus Before Pilate,” followed by “The Soldiers Mock Jesus” and “The Crucifixion of Jesus.” Finally there is “The Death of Jesus,” with its three references to Psalm 22. The upper image is courtesy of Palm Sunday (Wikipedia). The full caption: “Jesus riding on a donkey in his triumphal entry into Jerusalem depicted by James Tissot.” I used the image in 2015’s On Holy Week – and hot buns. See also On Holy Week – 2016. For further information on Psalm 22:16 see They have pierced my hands and my feet – Wikipedia. This entry was posted in Daily Office readings, Feast Days on April 9, 2017 by dorscribe@aol.com.